Lead Zeppelin wasn't going to work as it was going to bump up against Jimmy Page way too often. It did give us a reason to listen to "Stairway to Heaven" blasting through the studio most days. But then we do that anyway. Oh, well. Press of Sighs (idea taken from the "Bridge of Sighs" in Venice, Italy) has a nice feel to it. In our graphic design work when designing logos, we always like to put into the conversation that we liked the design (and the same for a logo) to both to talk to your target customer and also to your company's people. Focusing on creating work that made people "sigh" sounds like a good thing to remember every time you are designing or printing via letterpress. Lead Graffiti ended up being the "chosen one" because it worked on a variety of levels. The main problem with Lead Graffiti seemed that the word Graffiti, while interesting because of the hand-rolling, is a negative word. We imagined it floating around a conversation with a mother and daughter talking about wanting a wedding invitation. That felt a bit grating. But it was still the one we liked. Now we needed a way to turn that negative into a positive. That is always something we try to achieve. Now to find a way to do it to our logo. We went on the study abroad trips to London with Ray's students from 2001 - 2005. On those trips, we discovered CoinCraft, our favorite London store, right across the street from the British Museum, which sold a lot of coins and other antiquities. If you've seen our piece of cuneiform, that is where we bought it. In 2007 We designed the 300-page, hardback book, Histories of Newark: 1758 - 2008. The charter of Newark, Delaware, was signed by King George II, King of England. After the discovery that there was a silver half sterling coin minted in 1758 that had King George II's portrait on it, we designed a cover for a dozen deluxe copies which included an inlaid coin where you could see both sides. Seriously, how cool is that? We ordered 12 of the coins at $75 each. In early 2008 as we were starting to get our new 2,200 square foot studio space organized, we got a catalog in the mail from CoinCraft. While going through the catalog, we came across an item that was an 1885 British banknote which had terrific Spencerian script for the name of the bank. Hmmm. We emailed CoinCraft, and they still had the banknote, so we bought it. The banknote is shown at the top of this blog entry. 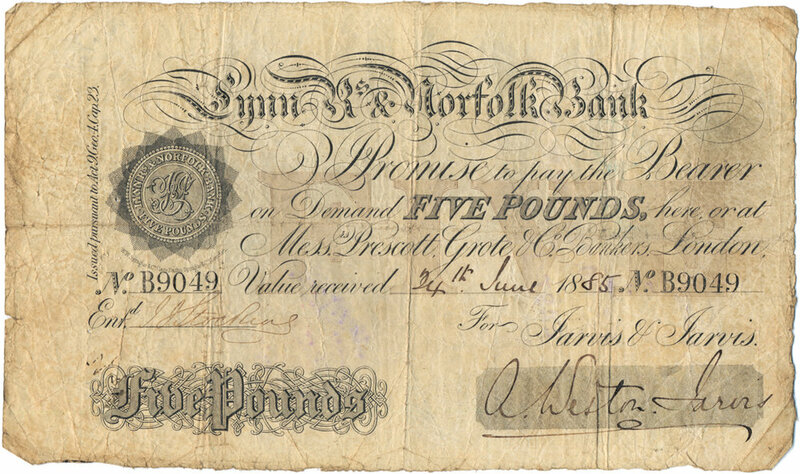 The banknote for the "Bank of Norfolk" gave us the r, a, and f. The rest had to be invented. The logo has an "ffi" ligature which is an excellent element for people who like type. It also offered the chance to design the ligature along with a second f and a second i.
Tray Nichols, Ray's son, did a killer job on the computer work. Now as we write this 10 years later we still love the logo and we think that is a positive thing. We would love to do an animation of the logo being drawn, but have no idea how to accomplish it. Anyone out there want to trade for some free time on our presses or something letterpressed with a severe discount (or maybe free) for that animation. LEAD was in Gill Sans Bold. The plan was always to do it in 2 colors that would change with every use If you look at our portfolio cards almost every one is different. Most times when we use the logo we like to rotate it 20° and bleed of an edge. Go back and look at the landing page for our website.